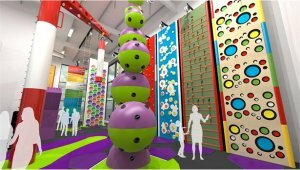 Climbing specialists Entre-prises have been appointed to install the innovative Clip ’n Climb climbing facility at the new £26m Dover District Leisure Centre. The community leisure venue which is due to open early next year will boast a range of facilities including an eight-lane county standard competition swimming pool, learner pool, sports hall, outdoor 3G pitches, squash courts, and 120 station fitness suite, along with the impressive Clip ’n Climb facility. 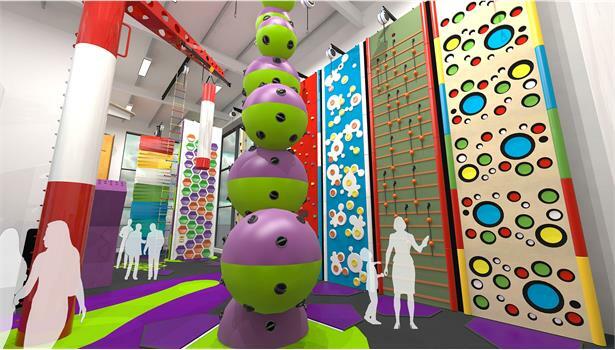 The colourful and vibrant climbing arena has been designed with 16 climb challenges including the Big Cheese, Astroball, Speed Climb, Leap of Faith, Twister and Stairway to Heaven. Cllr Trevor Bartlett, Cabinet Member for Property at Dover District Council said: "We hope to make Dover District Leisure Centre the destination of choice when it comes to getting our residents more active and enhancing the range of sporting opportunities on offer. The new Clip ’n Climb will really complement the leisure offer within the locality and offer people something new and challenging." The Clip ’n Climb facility will be installed by Entre-prises, a leading manufacturer of climbing walls with over 30 years’ experience designing bespoke solutions, that aim to create fun and vibrant environments to encourage even more people to challenge themselves and take up climbing. Mick Cooke from Entre-prises said: "The climbing facility has been designed to ensure that it has something for everyone whether they want to conquer their fears on the vertical drop slide or race against the clock in one of the timed challenges. We are looking forward to delivering this project and providing the community of Dover with a fun and innovative climbing experience." Clip ’n Climb uses Auto-Belay technology so a climber is free to climb without the need of someone to control the ropes at the bottom. The various heights and levels also ensure that anyone can enjoy the climbing experience from age 4 upwards as its fully inclusive and accessible for all ages and abilities. John Bates, Business Development Director at Places Leisure who will be managing the new venue, said: "Climbing is a sport which can be enjoyed alone or together with the whole family and we are excited to be able to offer this activity when the new centre opens early next year. At Places Leisure our social mission is to create active places and healthy people and with fantastic facilities such as these we hope to welcome all members of the community to come along and enjoy more active lifestyles."